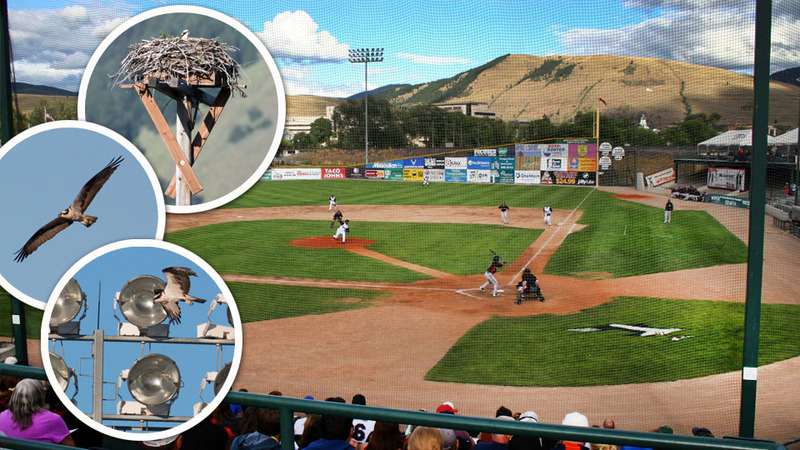 At the Missoula Osprey's home of Ogren Park at Allegiance Field, osprey are a common sight. A nest looms beyond the outfield wall. From Black Bears to Crawdads to Timber Rattlers, approximately half of all Minor League teams are named after a living creature. But only one team can claim to be named after a species that lives at the ballpark, in its natural habitat. That team is the Missoula Osprey. The Osprey, Rookie-level affiliate of the Arizona Diamondbacks, are in their 14th season at Ogren Park at Allegiance Field. Throughout that time, they've shared their surroundings with actual osprey. These large birds of prey live just beyond the fence in right-center field, in a nest located atop a tall, man-made platform constructed especially for the osprey's residential needs. The osprey, seemingly unperturbed by large crowds and the noise that large crowds can generate, are often seen flying in and around the ballpark while their professional baseball-playing namesakes are on the field. "Before there was a ballpark here, the osprey had a nest on an electrical pole," said team owner Judy Ellis, looking out onto the field from her office at press box level. "The electric company does not like them on the electric poles, obviously, so they erected the platform. They just put a couple sticks up there, and the rest comes naturally." Ellis, along with her husband, Mike (currently the president of the Northwest League), relocated the franchise from Lethbridge, Alberta, following the 1998 season. Their son, Matt, is currently the Osprey's executive vice president, a title that Judy herself once held. During Ellis' long tenure with the team, she's become a keen observer of the ballpark osprey. "The nests that the osprey build, they can eventually weigh up to a ton," she said. "It's huge. The osprey mate for life, but migrate separately and come back to the same nest every year. If one of them dies, they'll get another mate." Ogren Park at Allegiance Field is located in an ideal location for osprey, as the Clark Fork River runs just behind the ballpark. Fish from the river -- trout, in particular -- are a crucial food source. The Osprey's primary team logo references this specifically, as it features a flying osprey gripping a fish in its talons. "If there's chicks, the males will catch the fish, eat the head off and then bring the rest to the nest. The female will feed them," said Ellis. "When they catch the fish, they will actually turn it around so it is headfirst when they carry it. And sometimes they get big fish." The Missoula Osprey's osprey nest looms beyond Ogren Park at Allegiance Field's outfield wall. The ballpark osprey, along with others living along the Clark Fork River, are currently part of the long-running "Montana Osprey Project" conducted by the University of Montana. The project, involving osprey chicks, seeks to determine the long-term health of the river. In a nut (or egg) shell: Mercury from gold and silver mines contaminated the Clark Fork River. Osprey, as a result of eating fish from the river, began to suffer serious health defects related to the mercury. By tracking the health of the osprey chicks, researchers are also tracking the overall health of the river. "Every year the university comes out. They bring a cherry picker and go up to the nest," said Ellis. "They take the chicks out of the nest. They take a blood sample, a feather. They weigh them, measure them, do tests on them to see how they are. Then they band them. "[In 2014] one of the chicks from this nest was banded, and a woman in Corpus Christi, Texas, took a picture. She could see the band. She looked it up and found out that it was from our nest. They sometimes travel all the way to Mexico, but they'll come back here to the same nest." The osprey's long absence during the cold weather months can result in unexpected drama. In March of 2013, geese took over the nest; a mother goose, named Clara, resolutely defended her new domicile against the returning osprey. The osprey, desperate, eventually resorted to nesting atop a power line. The next year, the nest was made "goose-proof" via the addition of a metal mesh cone that was placed over it until the osprey returned. Ellis said she doesn't know how long the nest's current osprey occupants have been living there, but that she always enjoys their presence. "I usually spend as much time taking pictures of the birds as I do of the players," she said. "I've sometimes heard people call them our 'pets,' but they're not pets. They're wild animals. They come and go at will. They're really remarkable birds."